Routesetting is the heart of our business. Without the routesetters creativity, what would we project, crush, or send? Our routesetters spend hours stripping the walls, putting up routes and problems, then forerunning to make sure everything came out as intended. Every routesetter needs to develop ways to force moves while maintaining the most important element -- a problem or route that at its heart is fun. Problems and routes are set with a staggered rotation of 7 weeks or less so you will have no trouble finding a new project. Fill out our setting survey to provide comments to our setting staff! How long have you been climbing and setting routes/boulder problems? I've been climbing for over 15 years and have been setting consistently for the past 4 or so. What is your favorite climbing style? What advice would you give yourself on your first day of climbing? Have fun and don't get tied down with grades. Climb what inspires you. What was a pivotal moment in your climbing career? Climbing my first highball boulder at Devils Lake. It was the exposure coupled with the fear of falling, but being confident that I was good at what I was doing and I could send. What do you aspire to do for the climbing community with your setting? I want to push people to think about what they are climbing. The climb is a puzzle and to get to the top you have to solve the puzzle. It might not be the most straight forward climbing but you will have so much fun after you've completed it. How long have you been climbing and setting routes? I’ve been climbing for about 15 years and setting for about as long. I love climbing on slopers and pinches! What advice would I give to myself on my first day of climbing? Its all about technique! Oh, and, warm up more. What was a pivotal moment in my climbing career? When I realized grades were subjective. What do you aspire to do for the climbing community with my setting? Set problems and routes they can learn from and have a blast on! I've been climbing for four years, and setting for one. When I realized getting better is better than getting strong. I aspire to bring people together through the experience created by challenging and enjoyable movements. Flowy and fun are my favorite style regardless of grade. Long run out easy trad lines in the mountains are what I live for! Focus on having fun, skills are learned and developed over time, you’ll never put it the time if you’re not having fun. Ground fall on congratulations at Devil’s Lake. Climbing is dangerous, so stay within your abilities. I was young and eager and got ahead of myself. It took me a long time to trust gear after that. Routes that are challenging and fun. My goal is to set routes that you wish went on forever. I’d rather err on the side of easier but fun when I set. I really enjoy all styles, from whacky beta, to straight-forward boulders. For me, I tend to enjoy problems that “flow” most of all. 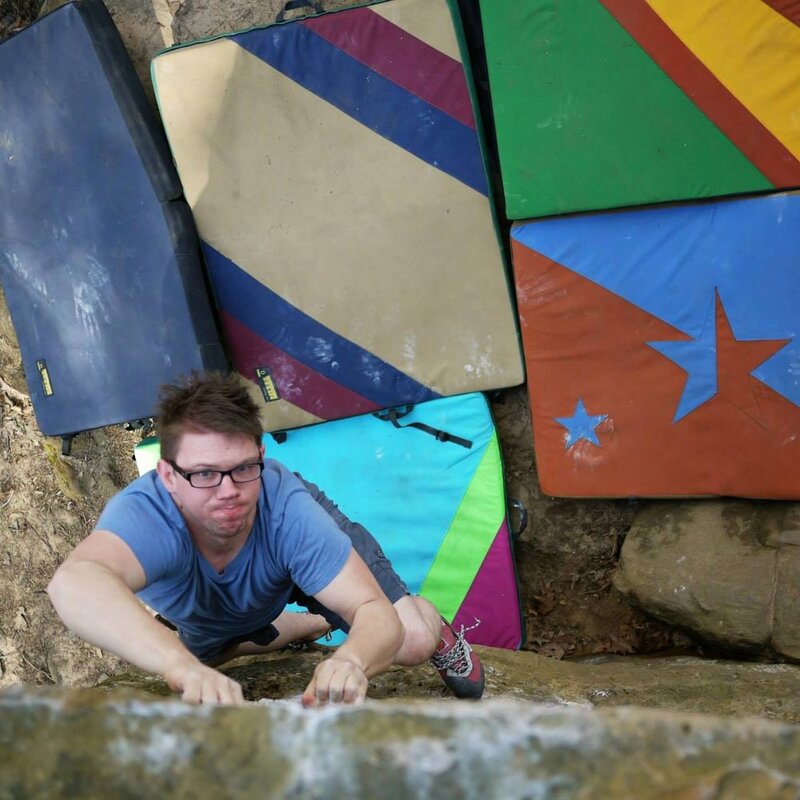 Flashing the 5 hardest boulders during one of my second ever climbing competitions. It showed that I was capable of pushing my abilities as a climber much farther than I had previously thought. It also served as a lesson (as a setter) that grading problems is very subjective and difficult. I’m hoping for the opposite - that the climbing community will help further develop me as a setter and climber. I've been climbing for about 4 years and setting for around 6 months. Try harder stuff even if you think you can't do it. When I started climbing outside and I realized there is always going to be something harder to climb. Set fun routes that suit people's different climbing styles and body types.